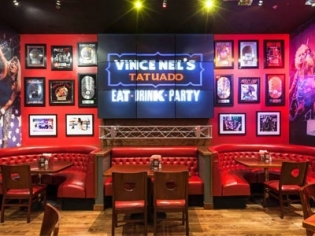 Whether you are a Motley Crūe fan or not, Vince Neil’s restaurant and bar is the place to hang out while in Circus Circus. It is open for breakfast and lunch as well as dinner and offers a late night menu until 3 am. The sports bar “Party Bus” is open until the wee hours of the morning. The atmosphere is reminiscent of Sunset Strip rock clubs from the 80’s. Music videos of big hair bands on the 22 HD flat screens will keep you entertained while you dine and drink. The menu offers a large variety of burgers, burritos, tacos, salads and classic entrees. Happy Hour 11 am – 7 pm seven days a week.